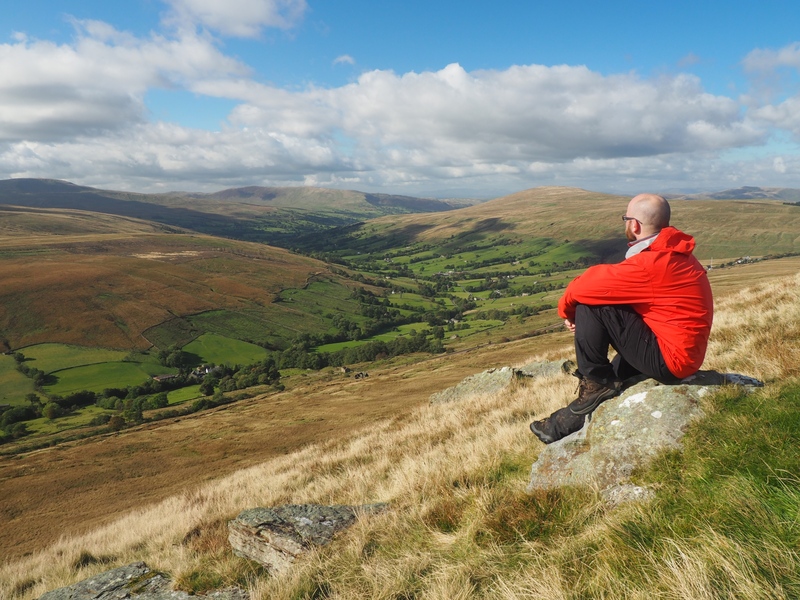 A super walk high above upper Dentdale climbing Great Knoutberry Hill via Arten Gill and Galloway Gate, returning over Wold Fell using the Pennine Bridleway. It had been over 11 years since my first and last visit to Wold Fell so I thought it was high time I went back. In order to extend the walk a bit I planned a route that would include a circular detour on to Great Knoutberry Hill utilising one of my favourite paths in the Dales – the old drove road known as Galloway Gate. After an interminable drive where I seemed to get stuck behind every tractor, sheep trailer, cyclist and slow driver possible I finally arrived at the small parking area below Dent Head Viaduct. The first section of the walk was a pleasant walk down the quiet road into Dentdale with the infant River Dee for company. Given my current obsession with waterfalls I was particularly looking forward to revisiting Scow Force. This nice little waterfall can easily be seen from the road but due to the sheer drop down from the roadside it isn’t the easiest to photograph. Much easier to take pictures of was the more modest waterfall further down the road just below the ford at Stone House. At Stone House I finally left the road to begin the long gradual climb up Arten Gill. This superb path passes below the Arten Gill Viaduct, probably my favourite viaduct in the Dales. Half way up the path I made a small detour down to the beck to visit one of the small waterfalls that can be found there. Having made this detour I continued to the head of the path. Reaching a junction I turned left to join Galloway Gate, an old drove road and one of the finest paths in the Yorkshire Dales. Contouring around the upper reaches of Great Knoutberry Hill this path provides some simply stunning views of Dentdale. Without following the path all the way until it joins the Coal Road I left it at a gate to follow a thin path climbing alongside a fence up on to Pikes Edge, with its collection of cairns, to eventually reach the summit of Great Knoutberry Hill. Visibility was excellent and the view included not only the neighbouring hills but a large sweep of the Lakeland fells as well as the Dun Fells in the North Pennines. My original plan had been to follow the fence down to Arten Moss (as shown on the route map above). However, as I was about to leave the summit I realised I no longer had my telephoto lens. Knowing exactly where I’d left it I had to retrace my steps to Galloway Gate to retrieve it. Thankfully it was still there so no harm was done. Finally arriving back at the junction of tracks I rejoined the Pennine Bridleway and followed it south as it curved around the shoulder of Wold Fell. After just under a mile it passed through a gate at which point I crossed the scanty remains of a wall to climb up on to the grassy summit plateau of Wold Fell. After visiting the OS spot height at 558m, marked by a meagre cairn in an area of exposed limestone, I made my way south-west to the 559m summit recorded in the Database of British Hills. By this point the skies had clouded over but I could see brighter weather approaching from the east. This seemed to take an age to arrive but when it did it was worth the wait especially as it was in turn being chased by some dramatic black clouds that made for some lovely light conditions on my descent. To conclude the walk I followed the Pennine Bridleway south to the road, turning right for a nice descent back to Dent Head. The final highlight of what had been a super day out was the view from the road down to Dent Head Viaduct backed by upper Dentdale.